Diagnostic health care is often restricted in areas with limited resources, because the procedures required to detect many of the molecular markers that can diagnose diseases are too complex or expensive to be used outside of a central laboratory. Researchers in the lab of Rustem Ismagilov, Caltech's Ethel Wilson Bowles and Robert Bowles Professor of Chemistry and Chemical Engineering and director of the Jacobs Institute for Molecular Engineering for Medicine, are inventing new technologies to help bring emerging diagnostic capabilities out of laboratories and to the point of care. Among the important requirements for such diagnostic devices is that the results—or readouts—be robust against a variety of environmental conditions and user errors. 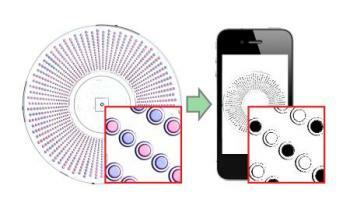 To address the need for a robust readout system for quantitative diagnostics, researchers in the Ismagilov lab have invented a new visual readout method that uses analytical chemistries and image processing to provide unambiguous quantification of single nucleic-acid molecules that can be performed by any cell-phone camera. The visual readout method is described and validated using RNA from the hepatitis C virus—HCV RNA—in a paper in the February 22 issue of the journal ACS Nano. The work utilizes a microfluidic technology called SlipChip, which was invented in the Ismagilov lab several years ago. A SlipChip serves as a portable lab-on-a-chip and can be used to quantify concentrations of single molecules. Each SlipChip encodes a complex program for isolating single molecules (such as DNA or RNA) along with chemical reactants in nanoliter-sized wells. The program also controls the complex reactions in each well: the chip consists of two plates that move—or "slip"—relative to one another, with each "slip" joining or separating the hundreds or even thousands of tiny wells, either bringing reactants and molecules into contact or isolating them. The architecture of the chip enables the user to have complete control over these chemical reactions and can prevent contamination, making it an ideal platform for a user-friendly, robust diagnostic device. The new visual readout method builds upon this SlipChip platform. Special indicator chemistries are integrated into the wells of the SlipChip device. After an amplification reaction—a reaction that multiplies nucleic-acid molecules—wells change color depending on whether the reaction in it was positive or negative. For example, if a SlipChip is being used to count HCV RNA molecules in a sample, a well containing an RNA molecule that amplified during the reaction would turn blue; whereas a well lacking an RNA molecule would remain purple. To read the result, a user simply takes a picture of the entire SlipChip using any camera phone. Then the photo is processed using a ratiometric approach that transforms the colors detected by the camera's sensor into an unambiguous readout of positives and negatives. Previous SlipChip technologies utilized a chemical that would fluoresce when a reaction took place within a well. But those readouts can be too subtle for detection by a common cell-phone camera or can require specific lighting conditions. The new method provides guidelines for selecting indicators that yield color changes compatible with the color sensitivities of phone cameras, and the ratiometric processing removes the need for a user to distinguish colors by sight." The readout process we developed can be used with any cell-phone camera," says Jesus Rodriguez-Manzano, a postdoctoral scholar in chemical engineering and one of two first authors on the paper. "It is rapid, automated, and doesn't require counting or visual interpretation, so the results can be read by anyone—even users who are color blind or working under poor lighting conditions. This robustness makes our visual readout method appropriate for integration with devices used in any setting, including at the point of care in limited-resource settings. This is critical because the need for highly sensitive diagnostics is greatest in such regions. "The paper is titled "Reading Out Single-Molecule Digital RNA and DNA Isothermal Amplification in Nanoliter Volumes with Unmodified Camera Phones." In addition to Rodriguez-Manzano, Mikhail Karymov is also a first author. Other Caltech coauthors include Stefano Begolo, David Selck, Dmitriy Zhukov, and Erik Jue. The work was funded by grants from the Defense Advanced Research Projects Agency, the National Institutes of Health, and an Innovation in Regulatory Science Award from the Burroughs Wellcome Fund. Microfluidic technologies developed by Ismagilov's group have been licensed to Emerald BioStructures, RainDance Technologies, and SlipChip Corp., of which Ismagilov is a founder.